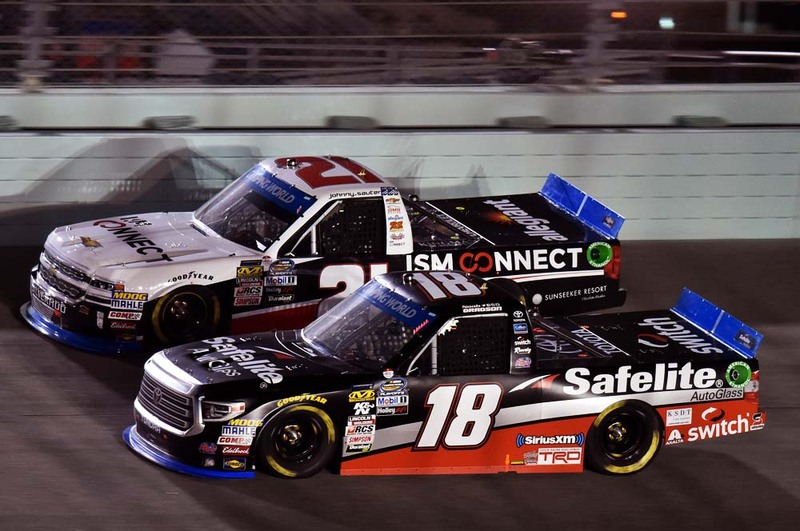 Noah Gragson capped off a solid sophomore season by finishing second to Brett Moffitt in the NASCAR Camping World Truck Series championship standings. Gragson put his Safelite AutoGlass Tundra at the front of the pack from laps 67 to 98 of the 134-lap event, but communicated to his crew that he felt like a tire was going down and had to hit pit road three laps ahead of schedule for his final green-flag stop. When stops cycled through, the Las Vegas native found himself in the third position over three seconds behind Moffitt with 20 laps remaining. As the race went caution free to the finish, Gragson would have to settle for a third-place finish in the race and second-place finish in the championship standings. The 20-year old driver finished his sophomore season pacing the Truck Series in several statistical categories, including poles (six), stage wins (10), laps led (625), driver rating (107.7) and average starting position (6.1). Gragson started from the third position but as the field headed into Turn one found himself three-wide in the middle and had fallen back to the sixth position by the completion of lap one. He slowly maneuvered his way back towards the front of the field making it into the third spot on lap nine and the runner-up spot on lap 14. The Las Vegas native found himself two seconds behind Grant Enfinger when he moved up to second and was only able to cut slightly into the lead before the field completed Stage One on lap 30. Before hitting pit road for the first time of the event, Gragson communicated to crew chief Rudy Fugle that “the back of the truck was out of the race track.” The over-the-wall crew administered a four-tire and fuel stop and returned their driver to the track scored in the second position. The talented youngster would take the lead for one lap after the restart, but then slid back to the third position on the next lap. Halfway through Stage Two he would regain the runner-up position and remain there when the stage ended on lap 60. 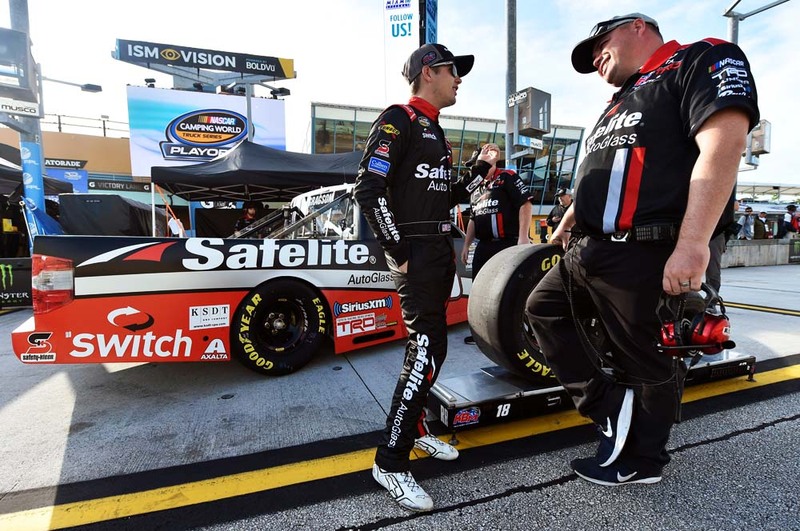 When pit road opened, Gragson brought the Safelite Tundra to pit road for another four-tire and fuel stop and once again returned to the track in the runner-up position. A strong restart propelled Gragson around Moffitt for the lead. For several laps Gragson would hold off a strong charge from Moffitt, who could get to his left rear but was unable to complete the pass. 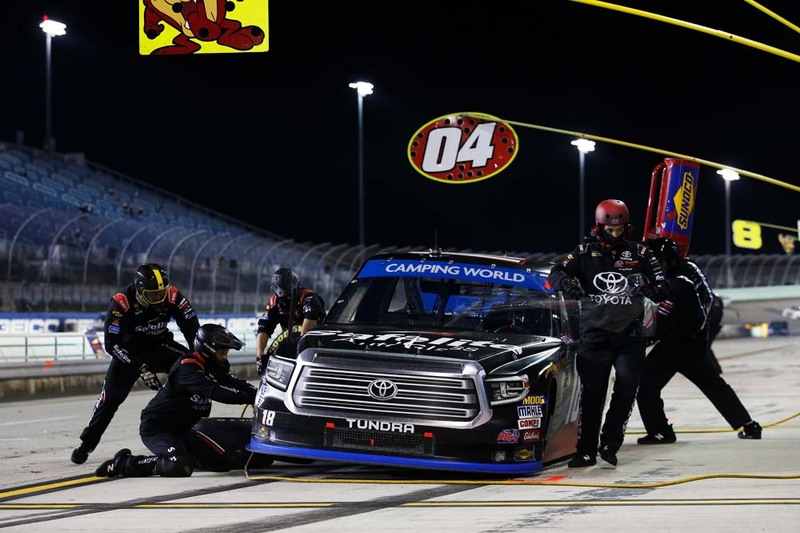 With 40 laps remaining, the Safelite Tundra was able to put a little distance on its fellow Toyota, but as final scheduled pit stops approached Moffitt would charge back. On lap 99, Moffitt got a strong run down the backstretch and made his way around Gragson. Shortly after, Gragson communicated that he felt like he had a tire going down and was summoned to pit road by Fugle. When stops cycled through on lap 114, Gragson found himself in the third position and would remain there when the field crossed the stripe for the final time in 2018. Gragson finished the season with one win, six poles, eight top-five and 17 top-10 finishes resulting in an average finish of 8.5 across 22 starts. Moffitt captured the 2018 Truck Series championship with his seventh victory of the season. Grant Enfinger finished in the runner-up position 2.00 seconds behind Moffitt. Gragson finished third while Steward Friesen and Sheldon Creed rounded out the top-five finishers. The race featured two cautions for a total of 12 laps, with both cautions being the stage breaks. There were 10 lead changes among seven drivers. Gragson led twice for 34 laps. 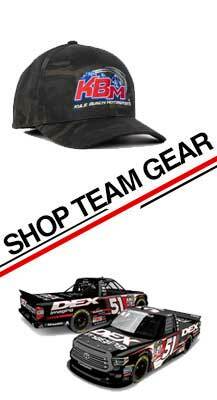 Harrison Burton will make his first start behind the wheel of the No. 18 Safelite AutoGlass Tundra when the NASCAR Gander Outdoors Series opens the 2019 season Feb. 15 at Daytona (Fla.) International Speedway.